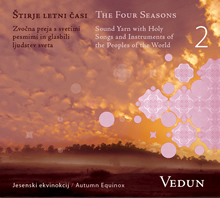 Recorded on the new CD of the ensemble Vedun – the second of the cycle “The Four Seasons” – is the concert, offered to the audience on the autumn equinox, on 22 September 2009, in the Gallery Equrna in Ljubljana. In a meditative way in the transcendental state of consciousness the performers, or the sound therapists, performed folk songs and tunes of the December ritual – mainly holy songs of diverse spiritual traditions – and enriched them with unrepeatable channelled healing media sound, which spontaneously “ran” through them on this occasion. 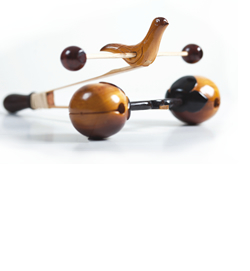 Thus, the sound, the spiritual tradition and the wisdom of the forefathers were joined into a complex sound weaving. ATTENTION: Original energies of transmission of the sound are preserved on the CD. By copying the CD they will be lost. Here is the new CD with the uncommon sound of the ensemble Vedun which was recorded in the gallery Equrna on the autumn equinox, on 22 September 2009. That means, in the time when our planet shares in the exceptional cosmic frequency vibration support which opens the cosmic bridge or portal to the spiral expansion of human consciousness into the infinite possibilities and unlimited capacities of the spirit, or into the uniform universal bio-field. We bathe in the sound that brings gifts for self-healing, consciousness development and attuning with the magnificent Cosmic Consciousness, for which every soul craves and towards which all our lives and efforts move. Already for millennia, in the time of equinoxes and solstices the humans have been opening and connecting themselves with the gifts of limitless Intelligence and Consciousness and discovering again and again new capacities of the spirit or the soul and drawing from the field of the original life essences and powers. On the autumn equinox the performers, in a meditative manner in the transcendental state of consciousness, sang songs of holy contents of different spiritual traditions and cultures from all the continents and enriched them with playing the shaman instruments of the peoples of the world and refined them with the unrepeatable channelled media sound that heals, which spontaneously flew through their media cosmic telepathy capacities – without the interference of mind: just for that moment and for all the present. In this way the essence of the Original Life Intelligence is most powerfully present and the mightiest and fulfils, balances and attunes all the bodies and spirits with the cosmic waves or the universal life stream which is the inaudible sound. Thus the performers and the audience also pay homage in a specific manner to the wisdom of the planetary forefathers. With the master recording technology we managed to preserve the presence and efficiency of the energy and the healing effect of the channelled sounds in order to be able to share them with you even at the CD playing. Thus the sound you hear from this CD, as well as from other CDs of the cycle “The Four Seasons”, can change, awaken, relax, cure and heal – your awareness, your thoughts, emotions and physical body, etc.